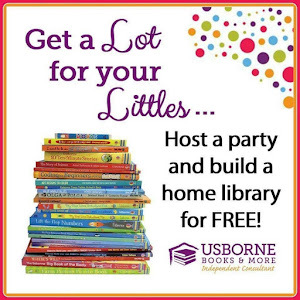 As a homeschool mom, I am always looking for ways to make learning fun, and anything is fair game. Including candy. 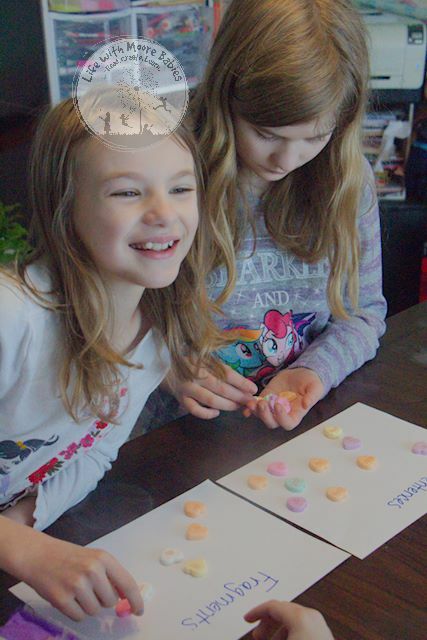 Candy is always a fun manipulative for math, but why stop there. I mean, conversation hearts literally have words on them, so why not use them for some language arts? First you need to label your papers. 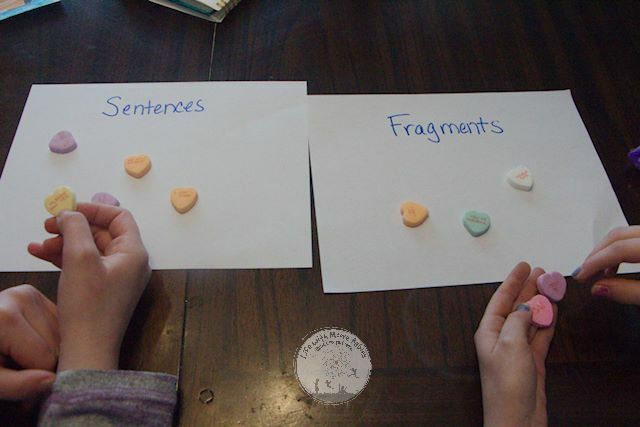 Since we are sorting sentences vs. fragments I labelled one paper "Sentences" and one "Fragments." After a bit of sorting I added a third under the sentences heading labelled "Understood You." If your kids need practice recognizing sentences that use an understood you as a subject you might just want to start with this paper too. 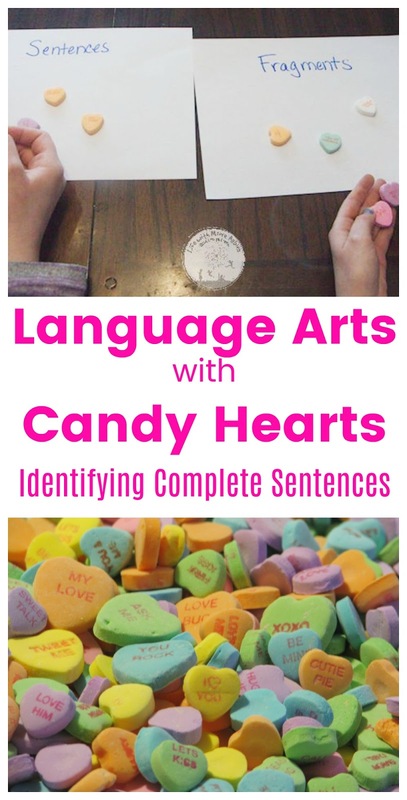 Now set your kids up with a bowl of hearts to sort. I say limit it to a bowl because I didn't, and they wanted to sort and subsequently eat the entire bag. At least with a bowl they have a stopping place. If you want them to do the whole bag, go for it! And just so you know, mine had to save most of them in a baggie rather than eat them all. 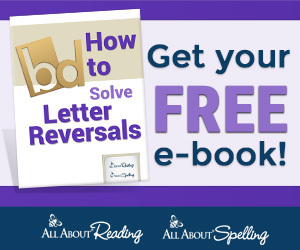 Before you let them start sorting, I would review what a sentence is versus what a fragment is. Basically a sentence is a complete thought and includes a subject and a predicate while a fragment is only a partial thought. 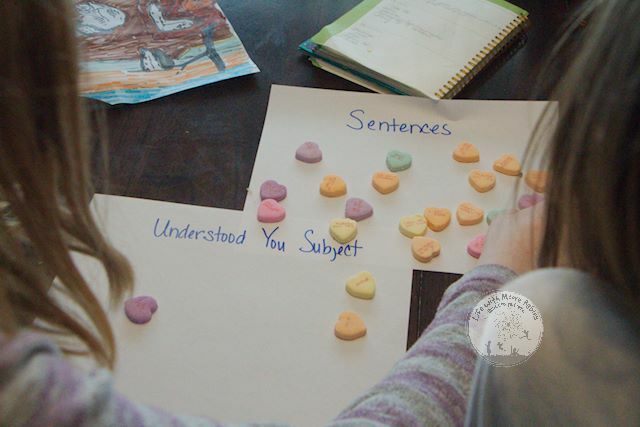 The thing about conversation hearts (the big ones at least) is that a large number of them include sentences with understood you as a subject; things like "Be Mine" and "Marry Me." The predicate is there, and the subject is whoever is reading the heart, or you. This can be a hard concept to recognize when labeling parts of a sentence. You can warn your kids about these sneaky understood you subjects ahead of time or just let them go and see how they do; that was my plan. Mine have been taught the concept of the understood you, but they miss it frequently in their labeling of sentence parts. Now they are ready to sort! I let mine go, you could time it too if you wanted to add a challenge or a limit to the sorting. I also let mine work together, but you could have each child do their own, there were more than enough hearts in that bag for my 2 older kids and probably a couple more. Meanwhile I watched. They were getting the fragments and the complete sentences correct, but those "understood you" sentences were giving them some trouble. About half went into sentences and the other half into fragments. This is when I stopped them and made the third piece of paper labeled "Understood You." I made sure to nestle it under the sentence heading, so they knew these were still sentences, the subject was just not written on the conversation heart. 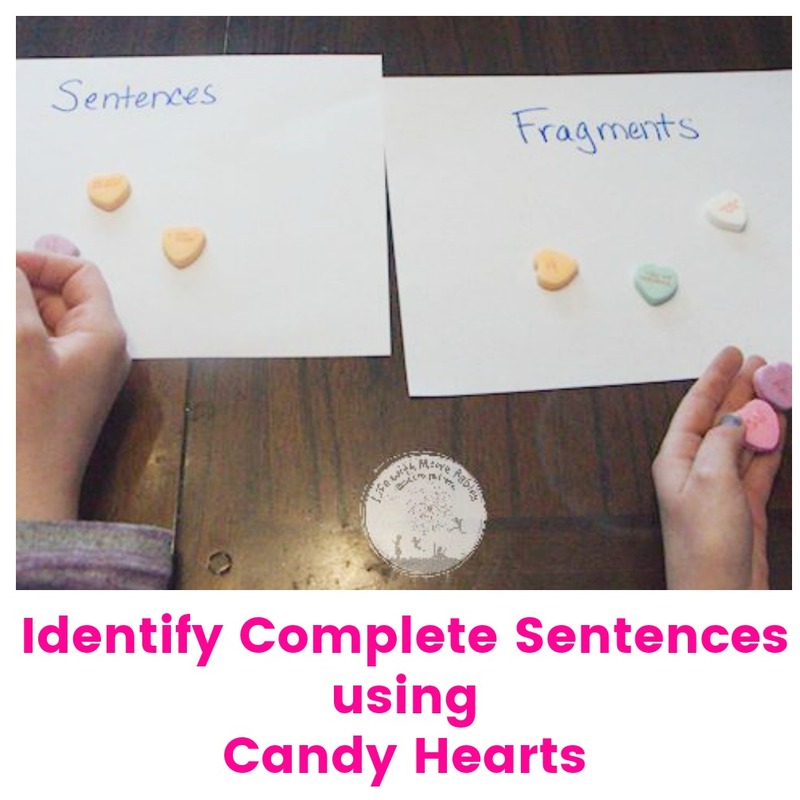 They wanted to keep sorting and sorting until their pages were stuffed and the candy hearts bag was empty! Overall using conversation hearts definitely made for a fun, and my kids would say tasty, lesson on sentences, fragments, and that tricky understood you.